Construction work on highways and bridges continues to grow in the first half of 2014, after several years of declines, based on the latest data from the U.S. Bureau of Labor Statistics. This increase in employment is consistent with the early market activity we have seen in 2014 after the market was depressed for five years. Employment increased by 2.7 percent (a gain of 9,000 jobs) in June 2014 compared to June 2013—sector specific data is always delayed by one month. Overall construction employment increased as well. The total construction sector added 211,000 jobs year-over-year between July 2013 and July 2014, a 3.6 percent increase. The overall construction sector’s unemployment rate was 7.5 percent in July 2014—well above the national average of 6.2 percent. 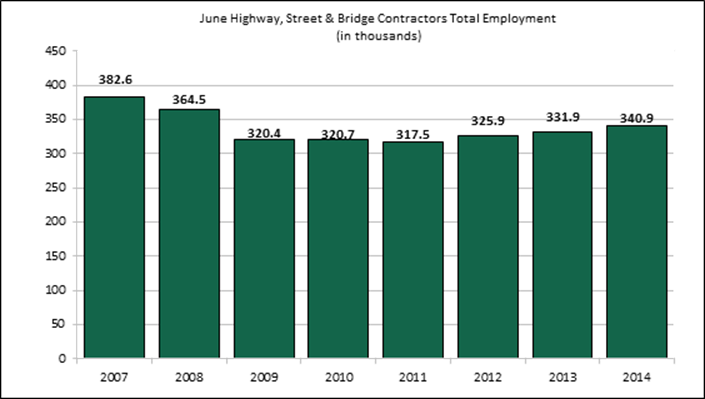 Highway and bridge construction employment was 340,900 in June 2014, compared to 331,900 in June 2013. In July, overall employers added 209,000 nonfarm jobs last month, and the unemployment rate increased to 6.2 percent.